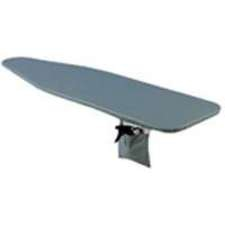 Household Essentials ironing board cover. Tailored nose for a snug fit. Bungee cord binding makes cover installation easy. Stain and scorch resistant coated. Cut to fit all standard 54" boards. Includes convenient side pocket. Made of colorfast, high count, long-lasting cotton fabric.